Please browse the products that are currently available. If you would like to purchase any of these materials, please visit our stores on TeachersPayTeachers or Teachers Notebook! 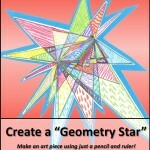 Create a Geometry Star – FREE!